Call me a snob, but I don't consider Lake County to be a foodie hot spot. If I have any say when picking where I'm going for dinner, most likely I'm heading west. (from where I live, at least) That typically puts me somewhere in the Tremont, Ohio City, or Lakewood area. But occasionally I end up east. Like a few weeks ago when I had a chance to have dinner at the newly opened Frank and Pauly's in Mentor. I'd never been the the "old" Frank and Pauly's in Public Square, but I know some people speak fondly of it. Since I'm running at least 40 miles a week right now training to run a 50k, I can use as many carbs as I can get so I was pretty excited to check this place out. And, in the sake of full disclosure, one of my friends had a gig playing guitar there the night I dropped by, so I was pretty excited to hear him play, too. Frank and Pauly's is located on Mentor Avenue in a historic building known as the Sawyer House. From the outside, it looks like...an old house. But after spending years and years as various restaurants, the interior looks more like a Maggiano's. Except for the lounge area. (not to be confused with the bar area) The bar area is just that - a bar. Order beer, wine, spirits, or shots here. (I wouldn't suggest mixing wine with shots like I did, though...ugh) The lounge area is more like a modestly stocked wine bar. You can only order off of a small menu of wine and a cheese plate, but you do get to sit in this cool area made up of multiple rooms filled with dim lighting, comfy couches, and bottles and bottles of wine. I'd compare it to sitting in someone's warm wine cellar. It was cool. I would go back in a heartbeat to hang out in the lounge if I lived closer. As for the rest of my dining experience...I'm torn here. I know the manager of Frank and Pauly's and let him know that my waiter was nothing short of scatterbrained and apathetic. He let me know that the person serving me was new, so I'm going to chalk up his attitude to jitters and not a generally bad disposition. But you never know. My boyfriend started off our meal with a bottle of wine. It's too bad our free bread didn't show up sooner, because it might have prevented us from drinking half of the bottle before our fried mozzarella appetizer appeared. Oops. And for that appetizer...it was ok. It's hard for deep fried cheese to be amazing. Especially when it's kind of cold when it gets to your table. For my entree, I ordered one of the few vegetarian items on the menu - the fuscilli vegetable ricotta sauce ($15), a corkscrew pasta in a cream sauce. Feeling extra hungry, I also ordered a cranberry and walnut side salad ($4.95.) 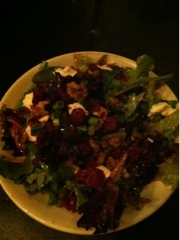 The salad was really good, and had goat cheese and cranberries in a raspberry vinaigrette. 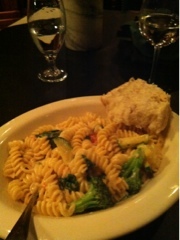 The pasta was also a solid dish. I'm not a big fan of high calorie cream sauces, but this one was alright. Nothing to wow me but nothing bad either. My boyfriend ordered a pasta with clams. Again, he thought it was good...but not spectacular. I loved that place when it was the Sawyer House - such a great building and the food was really good. I've always heard about F&P's but had never been to the original. Might need to check out that lounge at least!